Namaskar! As planned we celebrated Guru Purnima utsav in Ludhiana at Arya Smaj temple hall, urban estate. Our existing Karyakartas and expected Karyakartas participated in program. Total 35 participants offered pushpanjali to Om as guru. Shri Mohit goyal yuva samprak pramukh conducted the stage, Shastri ji from Arya smaj expounded the mystery of Om. Vishal Sharma, nagar pramukh introduced the activities and objectives of Vivekananda Kendra. Another program of Guru Purnima utsav in Ludhiana at Arya Smaj temple hall, urban estate. Our existing Karyakartas and expected Karyakartas participated in program. Total 35 participants offered pushpanjali to Om as guru. Shri Mohit goyal yuva samprak pramukh conducted the stage, Shastri ji from Arya smaj expounded the mystery of Om. 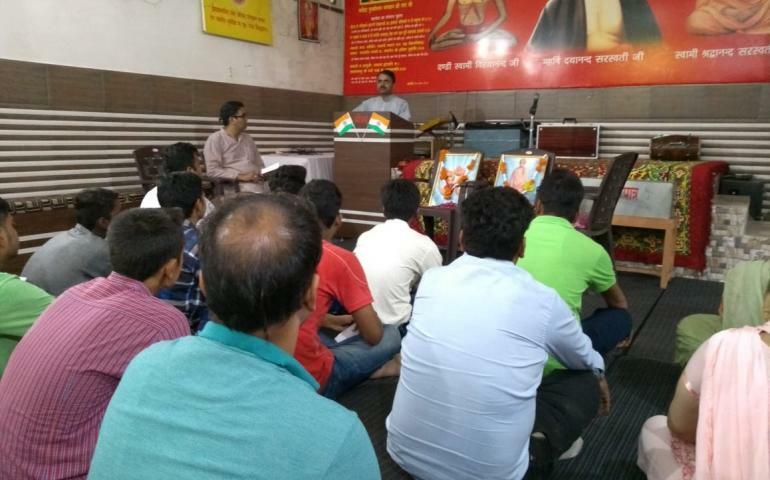 Vishal Sharma, nagar pramukh introduced the activities and objectives of Vivekananda Kendra.